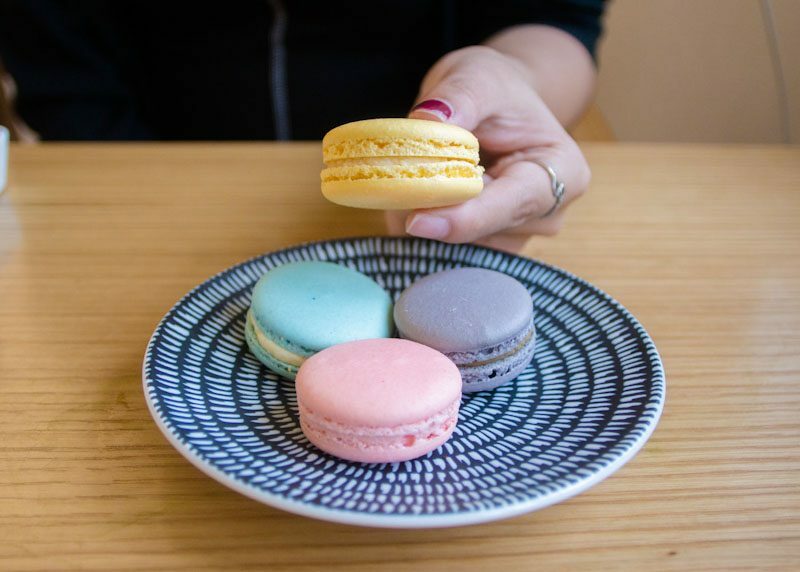 The cafe hopping trend is slowly on the rise again, and Grids & Circles is one of the cafes that has been largely raved about on the internet and one that I was excited to try. 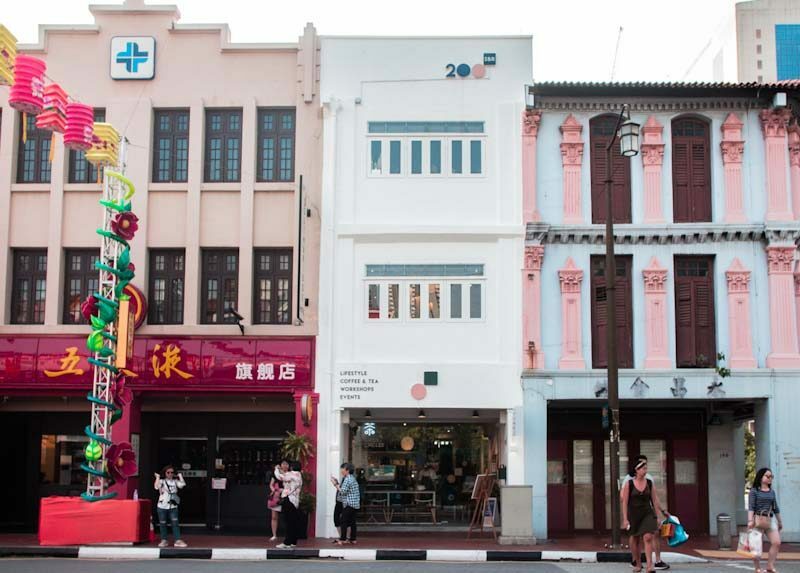 Sandwiched between a myriad of shop houses along South Bridge Road, this lifestyle cafe wasn’t an easy find. I even overlooked their simple and minimal logo while searching for it. I’m always fascinated by pretty and minimal cafes, and Grids & Circles was exactly that. 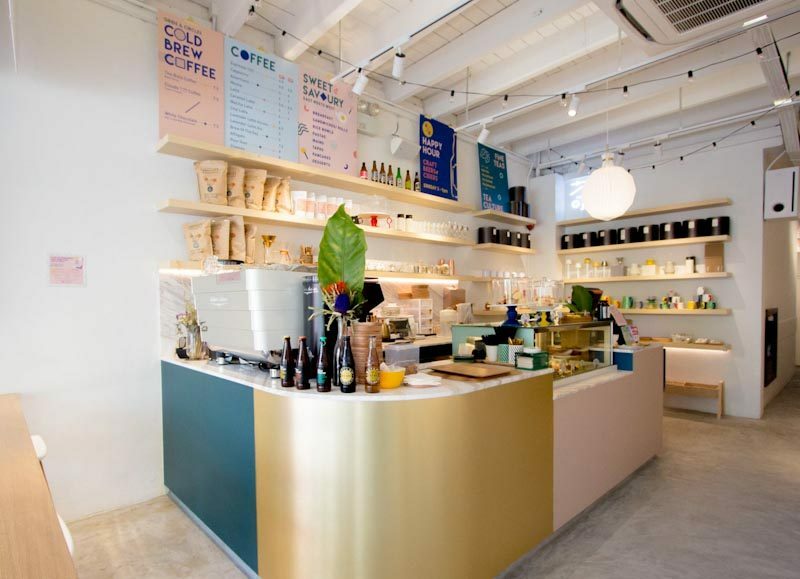 Upon entering, I was in awe of the interior design — the pink and gold countertop and pastel hues around the cafe made the cafe homely and welcoming. I’ve always been told that breakfast is the most quintessential meal of the day, but I’ve never been a morning person and waking up early is way too much of a hassle. However, Grids & Circles is about to change just that. 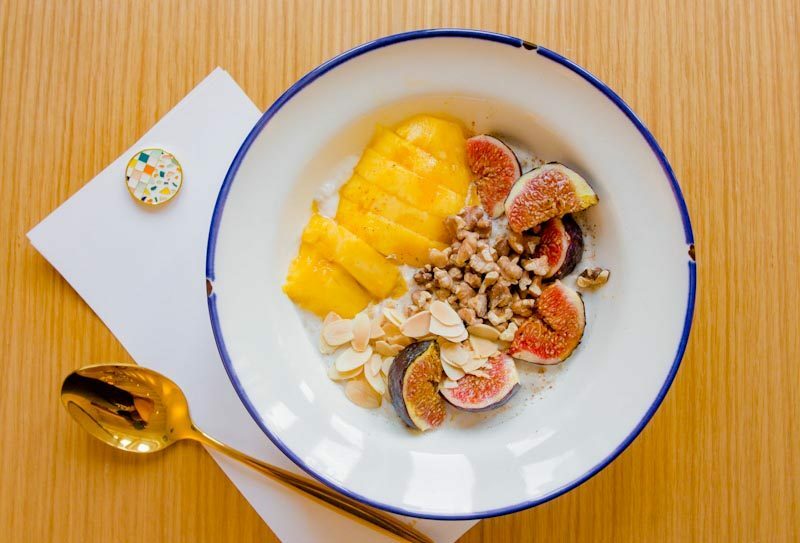 To start us off, we were served with a healthy breakfast in the form of their mango and figs oats (S$8). The oats were soaked in coconut milk, topped with a generous portion of figs, mangoes, almonds and walnuts. The coconut milk and mangoes were a match made in heaven, its taste was akin to Thailand’s mango sticky rice. It was simply delightful! The combination of juicy fruits, nuts and warm oats made this bowl hearty and fulfilling, and I couldn’t stop digging into it. Unfortunately, this particular flavour is seasonal. But fret not, Grids & Circles will be rolling out different flavours of oats depending on the fruits of the season. Looking for a more savoury option? The Tamago Sando (S$12) would be the dish to order, served with a side of greens and chips. 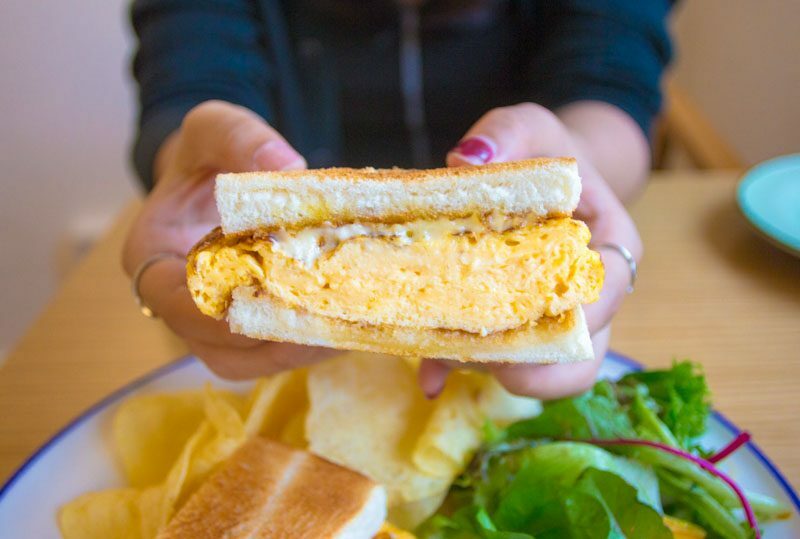 What’s not to love about a light and fluffy Tamago egg sandwiched between two toasted buns? The pear sauce and konbu mayo brought the flavours up a notch, adding a little sweetness and tanginess to what would seem like an ordinary egg sandwich. Having said that, the pairing of greens and chips were rather mundane, and not something I would opt for breakfast. I would have preferred having the Tamago Sando by itself instead. 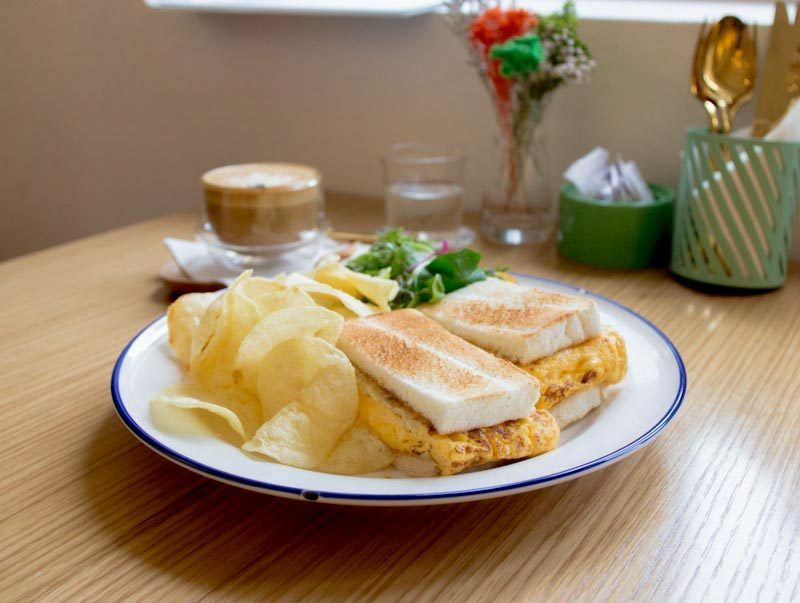 Grab a cup of Lavender Latte with Coffee (S$6.50) to go along with the Tamago Sando. 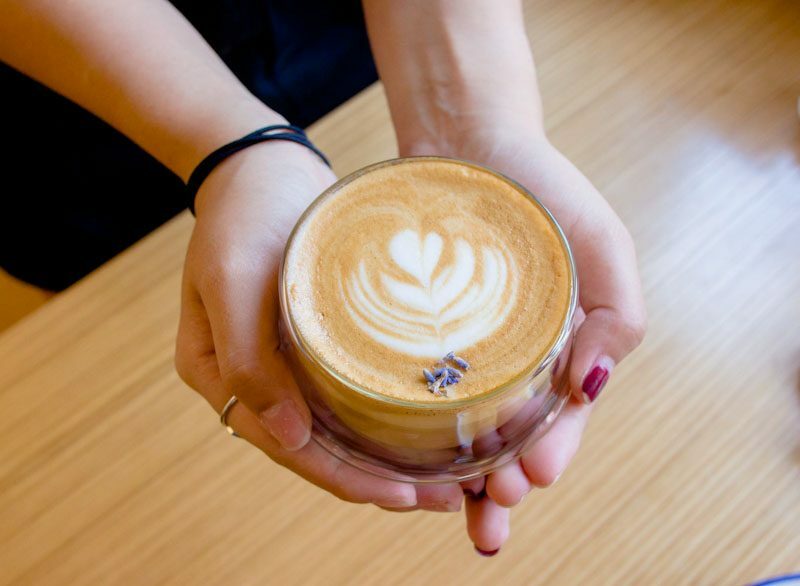 The bitter notes of this latte is a great balance against the sweetness of the pear kombu of the sandwich, and the lavender coats the palate with a subtle floral fragrance. Following the hearty spread of breakfast items, we were introduced to some of their afternoon mains. 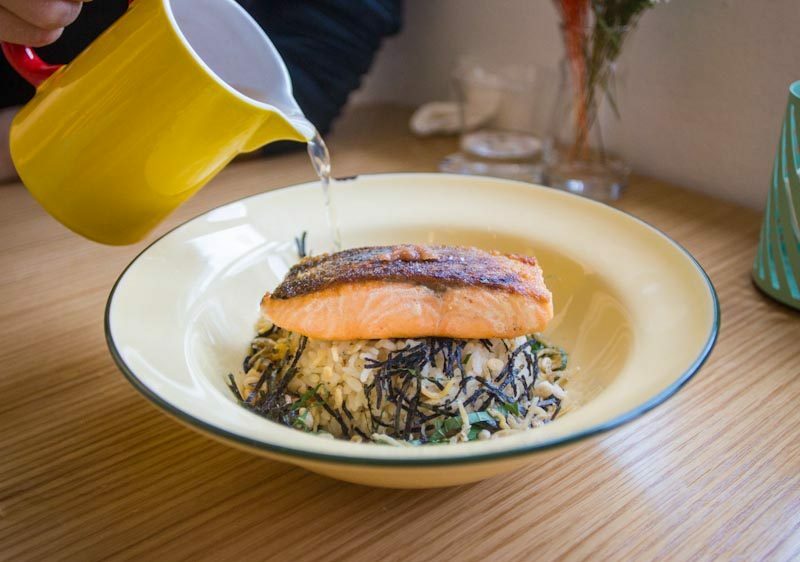 The Salmon Ochazuke (S$16) is a Japanese style porridge; one of the lesser known Japanese dish in Singapore. For this particular ochazuke, a bacon dashi green tea broth is poured over a bowl of nori, shiso and Kinmemai brown rice. 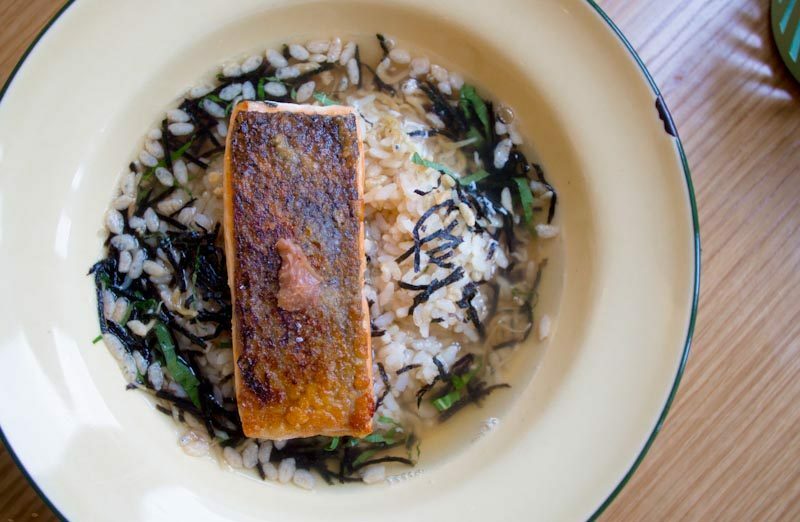 The salmon was soft and flaky, and the crispy skin gave it an extra texture. The great thing about allowing the customers to pour the dashi broth in by ourselves is that it allowed us to keep the fish crispy without it turning soggy. It also makes for a pretty good Boomerang for the ‘grams — definitely the pick for anyone feeling under the weather! For something heavier, we had the Pork Bowl (S$14). A brown rice bowl piled with sliced pork, okra, onion tare an buttered corn. Unfortunately, this Pork Bowl was just a run-of-the-mill. With tons of rice bowls stalls popping out throughout this year, this Pork Bowl would be easily forgotten. 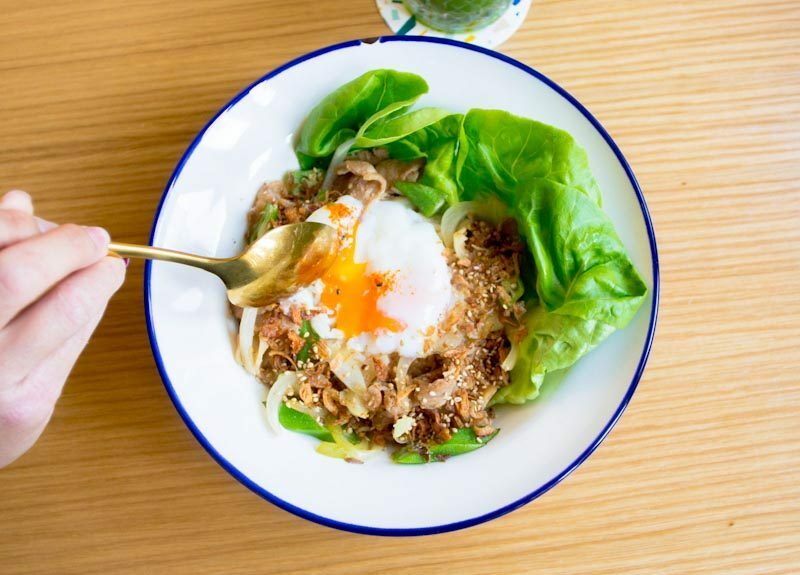 However, there were lots of greens served in this rice bowl, so if you’re looking for something healthier, this could perhaps be an option to go to for. An afternoon beer anyone? At Grids & Circles, not only do you get a large selection of tea and coffee to choose from, but also craft beers. 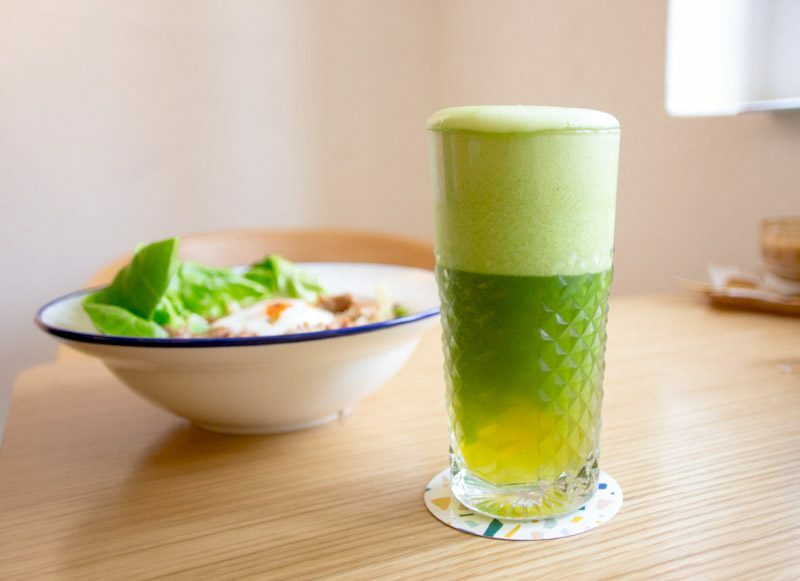 Hidden within their drink menu was a drink that caught my attention: Matcha Beer (S$15). That’s right! Matcha was poured into the beer right in front of us, allowing us to spectate and be wowed as the colour of the beer changed. At first, the taste of the beer was more prominent, but the bitterness that comes from the matcha shone through as we continued sipping. It was a light and refreshing, and easy to finish. I would recommend this to adventurous drinkers who are looking for something new! To round up our meal (geddit, cause circles are round), we were treated to an array of pastry and desserts. Their macarons were pretty decent, but nothing to rave about. I did enjoy the Earl Grey Macaron (S$3) though, the tea flavour was strong in this one. Other than the usual sweet macarons, The Cheese Macaron (S$3) was the more interesting flavour out of the lot, made with Parmigiano Reggiano. It was a mixture of sweet and salty, but unfortunately a little too peculiar for our liking. We also tried the Strawberry Wonderland (S$16), a stack of pancakes with fresh strawberries, strawberry compote, Chantilly cream and basil mint sauce. Fluffy Japanese Pancakes have been all the hype recently, so I was pretty excited as to what Grids & Circles would come up with. Unlike your usual fluffy pancakes, the Strawberry Wonderland was denser and thicker. There was a cake-like texture to it. The combination of strawberries and Chantilly cream was a safe option, and the lightness of the cream did help make the pancakes less jelak. Grids & Circles definitely didn’t disappoint. While not every dish was spot on and could be improved, there was a homely element to many of their dishes that made the food here comforting. I’ll definitely be back for that bowl of oats though, it was one of my favourite dishes out of the bunch! 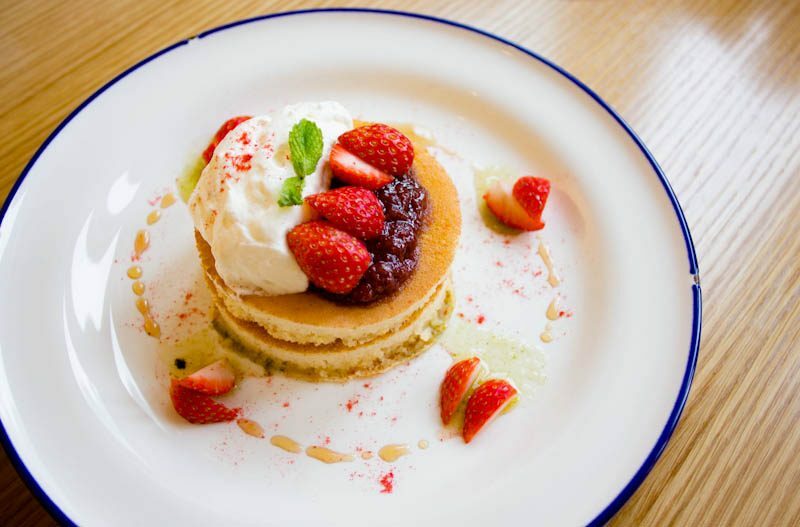 This three storey cafe not only serves great Japanese inspired dishes, but also functions an event and workshop space, rolling out with different workshops throughout the year. Do keep an eye out for them. So I guess, be there or be square? Get $10 off over 600 dining vouchers from ChopeDeals when you subscribe to our free mailing list! SETHLUI.COM is a Singapore Food, Travel, Nightlife online publication with more than 2.5 million page views each month. Contact us if you would like to request a review or article feature. © 2019 Delicious Consulting Pte Ltd. All Rights Reserved.